Photo caption: Principal Investigators of the Low Greenhouse Gas Emissions: Promoting Energy Efficiency & Renewable Energy Building in Jamaica (LGGE) Project, Professors Tara Dasgupta (left) and Anthony Clayton, in conversation with Hon. Desmond McKenzie (3rd left), Minister of Local Government & Community Development and Donald Moore, Senior General Manager, National Housing Trust prior to the start of the project’s second National Building Policy Workshop at the Jamaica Pegasus on June 6, 2017. The Low Greenhouse Gas Emissions: Promoting Energy Efficiency & Renewable Energy Building in Jamaica (LGGE) project which is delivering Jamaica and the Caribbean’s first Net Zero Energy Building (NZEB), has been lauded by the Hon. Desmond McKenzie, Minister of Local Government & Community Development. He was speaking at the second in a series of National Building Policy Workshops under the project being implemented by the Institute for Sustainability Development (ISD) of the University of the West Indies (UWI) with financial support of the Global Environment Facility (GEF) and technical assistance of the United Nation Environment Programme (UNEP). Similarly, the Minister said “the efficient regulation of building use is critical to economic growth, economic development and social order”. 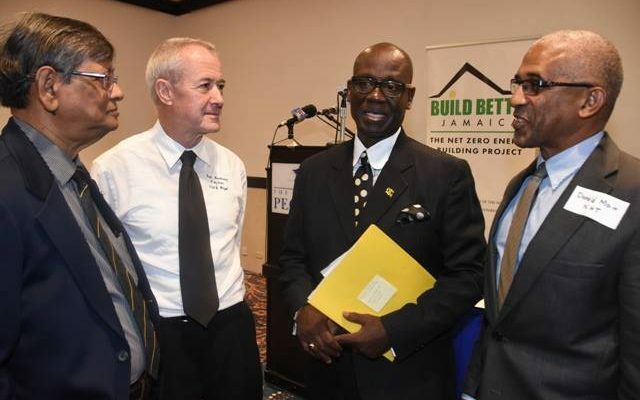 Pointing to a new Building Bill 2017, he would begin piloting through the House of Representatives on June 6, 2017, Minister McKenzie said the timing of this workshop could not be better as many of the issues on the workshop programme are captured in the Bill which will “reflect new construction and environmental standards as they evolve. The results of the discussions of your workshop about building policy may be facilitated through the Building Advisory Council established under section 75 of the Bill”, he assured the LGGE administrators.